In an effort to create a connection between vital economic trading partners, U.S. Congressman Scott Peters (CA-52) and World Trade Center San Diego, an affiliate of San Diego Regional EDC, are leading a delegation to Tokyo and Yokohama, Japan. During the trade mission, local companies and organizations will promote key San Diego industries, establish and develop business relationships and explore opportunities for San Diego companies to tap into Japan’s expertise in urban planning and life sciences. Japan is currently the third largest economy in the world, and one of San Diego’s most vital trading partners. According to World Trade Center Los Angeles, nearly 12,000 San Diegans are directly employed by Japan-based companies including SONY, Takeda and more. Additionally, there was more than $3.4 billion in economic activity between San Diego and Japan from 2016 -2018. An announcement from a San Diego-based biotech startup that is expanding to Tokyo. A ‘trends in venture capital forum’ with Qualcomm, Yahoo! Japan and others at Plug and Play, the world’s largest technology accelerator. A celebration of more than 60 years of a “Sister City” relationship with Yokohama, Japan. An immersive visit to Takeda’s Shonan Health Innovation Park, one of the first collaborative academic and private sector research centers in Japan. Panels and programming surrounding best practices and ideas exchanges on climate change with Scripps Institute of Oceanography as well as leadership and gender equity. Delegates will participate in upwards of 15 meetings over the course of the trade mission, sharing best practices and formulating collaborations across many verticals. The 31-San Diego delegates include representatives from Northrop Grumman, Qualcomm Takeda California and more. Also in attendance are key San Diego agencies, universities and civic organizations such as the Port of San Diego, San Diego County Regional Airport Authority, San Diego State University, Scripps Institute of Oceanography, UC San Diego and more. Additionally, many small businesses and startups, including FoxFury Lighting Solutions, Planck Aerosystems and Scientist.com, will have the opportunity to engage in business development opportunities with Japanese counterparts. As Tokyo looks to modernize infrastructure and grapples with key issues ahead of the 2020 Olympics, San Diego leaders have the unique opportunity to learn from counterparts across the globe, while also maintaining ties that create jobs and boost the regional economy. At a time of mounting global uncertainty, World Trade Center San Diego conducts periodic trade missions to drive long term relationships for San Diego’s economy. In 2017, World Trade Center San Diego and Congressman Peters led a trade mission to London, which enabled startup Forge Therapeutics to double its headcount in San Diego and expand to a new facility. This trade mission is organized by World Trade Center San Diego, an affiliate of the San Diego Regional EDC. Follow along during the trade mission: #SDinJapan. And they’re here! Welcome #SDinJapan. Find us a better group of people to tell the #SanDiego story to the world....we’ll wait. WTC San Diego was on the road again last week, joining Biocom, UC San Diego and four San Diego life sciences companies for BioJapan in Yokohama. 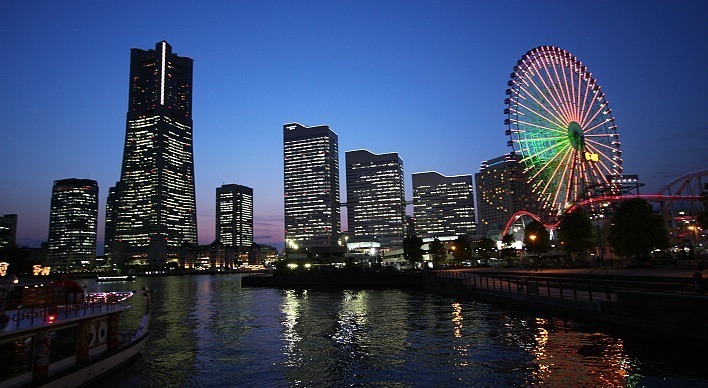 Yokohama is San Diego’s sister city; a lovely port city of 3.7 million people—and Japan’s second largest metro—that often gets lost in the shadow of nearby Tokyo (sound familiar?). Yokohama was an auto manufacturing and export capital, and in the words of city officials, “home to the very first Japanese auto company: Ford motors.” As much of that manufacturing moved to lower cost destinations in Asia, Yokohama has had to pivot towards more knowledge-intensive industries like ICT and life sciences. I toured several research spaces and innovation houses in which the city government has invested to support these new industries. Yokohama and San Diego will celebrate the 60th anniversary of the sister city relationship in 2017, with a visit from Mayor Hayashi. I carried with me this time a letter from San Diego Mayor Kevin Faulconer, celebrating this relationship as both sides look to build upon long diplomatic relations with more robust business and commercial exchange. A quickly-growing gateway into the Asian life sciences industry, BioJapan 2016 hosted 800 companies, 15,000 visitors and was sponsored by big San Diego employers like Takeda, Ajinomoto, Kyowa Kirin, Chugai and J&J Innovation, among others. Japan is the second largest pharmaceuticals market globally after the U.S., and is also San Diego’s second largest source of foreign investment. 'Asian multinationals have been shifting significantly from legacy industries into new growth verticals: Ajinomoto moving from food additives to pharmaceuticals; Samsung exploring biologics, precision instruments and wireless health; and FujiFilm expanding from cameras to vaccine manufacturing. However, as Takeda CEO Christophe Weber shared in his keynote, the majority of big discoveries in this space are being generated by startups and SMEs, which is why aligning corporate capital and strategy with venture-fueled innovation is essential for the future of the global life sciences industry. This is where the opportunity for San Diego lies. San Diego does innovation very well, which is why BioJapan is a great opportunity for partnering and sales opportunities for local companies targeting Japan. Companies like Organovo, a San Diego company that “bioprints” human tissue, traveled to Yokohama for partnering meetings. Founded in 2007, Organovo now employs more than 100 people and is trading on the Nasdaq. Even as new trends and technologies change the industry in both Japan and San Diego, it is clear that the importance of relationship building remains paramount. Biocom has made a long-term investment in the region, and has cultivated a widespread respect for the California life sciences ecosystem. Biocom now has 40 member companies in Japan, and on this trip signed an MOU with the Kobe biocluster and opened a Biocom Japan office; its only presence outside the U.S.
UC San Diego has similarly focused on Japan, opening its own office in the prestigious Nihonbashi life sciences building in central Tokyo earlier this year, and building robust industry and university research and training collaborations across Japan, in everything from medicine to robotics to entrepreneurship. As Biocom continues to build bridges between global life sciences clusters, and UC San Diego reinforces them with world-class research alliances, WTC San Diego’s objective is to build the sustainable infrastructure to move companies across those bridges, through export programs like MetroConnect, and the creation of innovation investment networks. In 2016 we have participated in a Technology Symposium, spoken to 400 investors in three cities about opportunities in San Diego, and partnered with JETRO to connect MetroConnect companies to business opportunities in Japan. As always, increased collaboration globally—especially in our most competitive and high-growth sectors—amplifies our outcomes for the region as a whole, creating jobs, opportunities and connectivity. Luckily, collaboration is something San Diego does well. Given the deep linkages between our regions, it is fitting that the World Trade Center San Diego 2016 calendar of trade and investment activities begins with a targeted focus on Japan. Sean Barr sent his reflections from Tokyo last week, where he was supporting a UC San Diego Technology Symposium and representing our region at an international nanotechnology and robotics show. And this week I am traveling across the country with SelectUSA, the federal government’s foreign investment attraction agency. Japan is the second largest source of foreign direct investment to the United States, and more than 800,000 Americans are employed by US subsidiaries of Japanese firms. San Diego is a microcosm of this larger relationship, with companies like Takeda, Kyocera, Ajinomoto, and Murata employing thousands of San Diegans. On Monday we kicked off the Roadshow in Tokyo with HE Caroline Kennedy, Ambassador to Japan; Ambassador Vinai Thummalapally, Select USA Executive Director; and Mr. Tatsuhiro Shindo, Executive Vice President of JETRO for the signing of an historic MOI. We then moved on to Nagoya and Osaka, meeting with groups of potential investors at each stop. Representatives from the head offices of Japanese companies that have made long term investments in our region joined me on the road. Their eagerness to support our efforts here and tell their own San Diego story to their peers is a testament to the deep ties between our two economies. In Tokyo, Toshitake Kobayashi from Takeda Pharmaceuticals joined me to speak to the group of 200 potential investors about how collaboration between Takeda California and Takeda Japan drives innovation in drug discovery for the firm as a whole. This is why Takeda closed its Bay Area facility and consolidated operations in San Diego. Takeda is Asia’s largest drug manufacturer, employing more than 30,000 people worldwide. Naoki Mori, from Nitto Denko, a water technology company that acquired Oceanside firm Hydranautics in 1987, joined me in Osaka to share his perspective on the advantages of our region. He emphasized the premier universities and research institutions as we spoke to another packed room of over 100 investors interested in the US market. Three companies from diverse industries delivering the same message: San Diego’s innovation ecosystem – with its strong research institutions and top-tier talent - is a world-class asset. And yet, it is clear that in terms of maximizing these assets, we could be doing more. Out of over a dozen states and metros participating in the roadshow, San Diego is the only one without a Japan trade office staffed with dedicated investment personnel. Our investors and partners have done tremendous work over the last few years to generate a comprehensive trade and investment plan for the region. And our Port, Airport and City are driving the execution of that plan through the revitalization of World Trade Center San Diego. That kind of regional coalition building is both rare and formidable, and for that we are grateful. So you will be hearing much more about Japan in the coming months, as we prepare to host several incoming delegations of Japanese companies in advanced industries. And you will also be hearing from Auckland, Sydney, London, Toulon, and Stockholm, as we work to grow exports to, investment from, and relationships with the markets that matter most to San Diego’s growth, prosperity and resilience. Big thanks and kanpai to the San Diego leadership of Takeda, Denso, and Hydranautics for coordinating support on the road, and for the language lessons too. Investor Spotlight: Kyocera International, Inc. This week, EDC talked with Jay Scovie, director of Corporate Communications and Education at Kyocera International, Inc. The company – with its North American headquarters in San Diego – manufactures high-tech products for use by semiconductor companies, among others. In just under five decades, the company’s North American operations have expanded to more than 4,000 employees dedicated to the development of innovative products. 1) Please tell us what your company does. Kyocera was founded in Japan in 1959 — our name comes from “Kyoto” and “Ceramic.” We serve many diverse high-tech markets, including office document equipment, telecom equipment, solar energy, and engineered components, which are used in electronic, medical, industrial and automotive applications. Much of our work is tied to the semiconductor industry. In 1971, we became the first Japanese company with manufacturing operations in the State of California. We have manufactured ceramic semiconductor packages in San Diego for 44 years. Our telecom equipment business came to the U.S. in 2000 when we acquired Qualcomm’s wireless phone business. And today, many leading institutions in San Diego (and worldwide) generate renewable power using Kyocera’s solar modules, which are based on silicon cells, a type of semiconductor. It sounds trendy now, but Kyocera started its solar business in 1975, making us one of the early solar pioneers. 2) What are some advantages to being located/doing business in San Diego? My short list would begin with “best climate on Earth,” which makes San Diego ideal for events and tourism. I’ve never lived in another city where you could enjoy pristine beaches, desert, mountains and snow, all in the same day. From a business standpoint, San Diego has an entrepreneurial culture, globally-renowned universities, Pacific Rim gateway status, and of course, U.S./Mexico manufacturing and trade. We are a global hub for wireless and biotech, with legendary research institutes like Salk, Scripps, Venter, Sanford Burnham Prebys, and yes, the Zoo and SeaWorld. We have unique technology incubators like Biocom and Connect. These all make San Diego “the place” for great minds to meet, with unique meeting opportunities — like the Kyoto Prize Symposium. Certainly, a lot of people moved to San Diego for the weather. That’s no surprise, but the weather is really just a bonus. 3) San Diego is full of dynamic companies, firms and service providers influencing global trends and innovation. Pick another San Diego company that is at the top of its game. Can you really pick one favorite? Ballast Point would have to merge with Rubio’s. Nobody has a crystal ball, but if you ask this question in a year I think we’ll all be saying it’s Qualcomm — again. They are constantly reinventing, and their current restructuring is going to be pivotal. It’s easy to envision Qualcomm emerging leaner, more focused, and ready to establish new paradigms for the global communications industry — again. 4) What do you anticipate for your company in five years? What do you anticipate for San Diego? Globalization will continue, and companies with a global network for R&D, supply, manufacturing and marketing will fare best. That should be good for Kyocera. The forces shaping our global economy generally align to create new markets for Kyocera’s core products and technologies. Our founder, Dr. Kazuo Inamori, has always considered it impractical to make long-term business plans – even five-year plans – due to the pace of change in technology. Instead, we focus on accumulating small results daily, making today better than tomorrow, and tomorrow better than today. We are very fortunate that our advanced materials have such broad application in the fields of electronics and industry, in many of the most innovative new components, devices and equipment. This gives us potential to improve the lives of millions of people in the areas of information processing, communications, renewable energy, medical technologies, and automotive components. What do I anticipate in five years? Kyocera will still be thriving. The company will still have North American headquarters in San Diego. And I expect to be here, too, although if it’s lunchtime… I may be at Rubio’s. Kyocera Corporate Profile from CC&E on Vimeo. This past week, EDC traveled across the Pacific - by way of our direct JAL flight - to release the National Geographic documentary in one of San Diego’s largest international trade and investment cities: Tokyo. 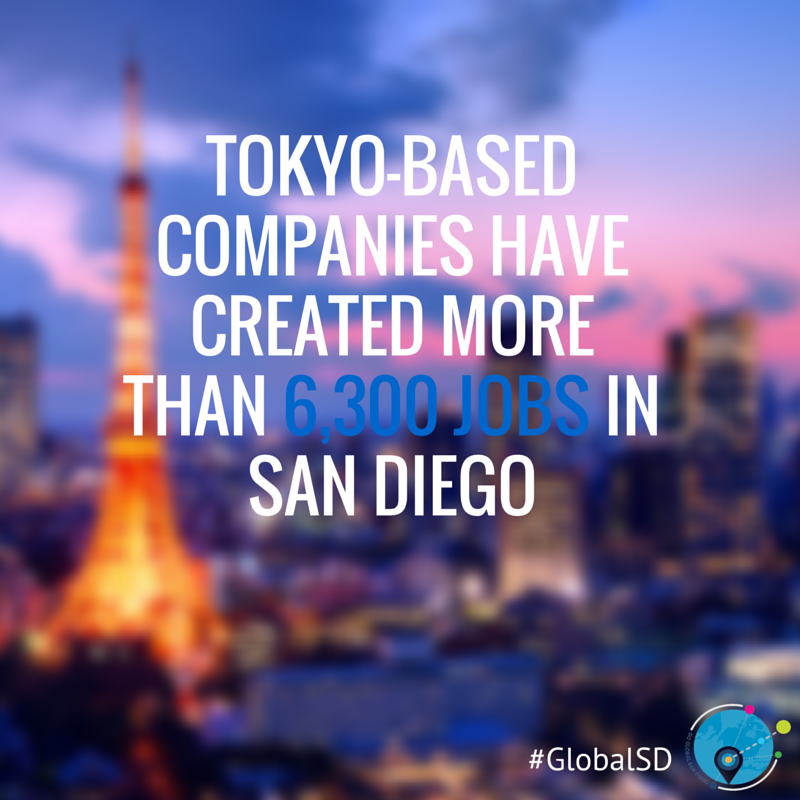 Tokyo based companies employ more than 6,300 people in San Diego, ranking as the largest source of foreign employment. When looking at advanced industries, these companies primarily invest in audio and video equipment manufacturing, semiconductor manufacturing, and medical equipment and supplies manufacturing. According to the Japan External Trade Organization (JETRO), companies that fall into these industries reported they will record a surplus in business profit in 2014 – a positive sign for San Diegans employed by these very same companies and our economy. As part of the trade missions, EDC met with Japanese companies and organizations which have San Diego ties in order to strengthen relationships and learn more about specific challenges they face. EDC, San Diego County Regional Airport Authority, San Diego Tourism Authority, and Supervisor Ron Roberts met with Japan Airlines. The Airport gave an impressive update to JAL, stating that the flight has been very successful since the launch. The Airport, along with the other delegates, impressed upon JAL that the direct flight between San Diego – Tokyo is among the most important for the region, continuing to strengthen the business ties and drive investment into the respective regions. EDC met with the U.S.-Japan Embassy following the JAL meeting. This meeting served as an important connection for San Diego, as many of the Embassy staff in Japan focus on industries important to the region – aerospace, life sciences, cybersecurity and defense. Having Embassy staff understand the strengths and assets of San Diego help to build a bigger and better portfolio for staff, especially when they are meeting with companies important to the region. Day 1 concluded with a dinner at the American Club in Tokyo. JPMorgan Chase sent their commercial industry representative, Mr. Satoshi Yamamoto, who gave an overview of the Tokyo economy and companies that are and will be important to San Diego. Day 2 began with a 2 hour ride to Takeda Pharmaceuticals in Kanagawa. As one of the largest pharmaceuticals companies in the world, and the largest in Japan with more than 3 million employees worldwide, Takeda is one of San Diego’s most important companies. After consolidating the San Francisco office into San Diego, more than half of all research and development now occurs in San Diego. Following the morning’s meeting with Takeda, EDC participated in a lunch with Al Pisano, Dean of UC San Diego’s Jacobs Schools of Engineering, and UC San Diego alumni located in Tokyo. The lunch proved to showcase the many interesting and important people UC San Diego brings through its campus – with alumni working on robotics to running their own business in Tokyo. After lunch it was off to San Diego’s iconic example of how an acquisition can be extremely beneficial to the success and profitability of a company; Ajinomoto. Ajinomoto acquired Althea Technologies in 2013. Since then, Althea has proved a successful venture for Ajinomoto – forging a strong pathway for the company’s expansion into the healthcare sector. Good thing regenerative medicine is becoming a focus in Japan, because San Diego has plenty of resources to go around. Whiz Partners, a private equity firm located in Tokyo, helped bring insight into what funds in Japan are focusing on and what companies in the near future will look for. The evening’s activities began with the Jacobs School of Engineering seminar. Dean Pisano gave a presentation about some of the incredible research being undertaken at the university – from microchip processors that are small enough to be a patch to monitor a premature baby’s vitals to technology around a smart grid, analyzing data to improve and streamline energy use on campus. The premiere hosted more than 140 Japanese business leaders – including executives from Toray to Toshiba to JAL to Panasonic. The final day of the trip EDC met with the Japan External Trade Organization (JETRO). JETRO acts as the commercial service office for the country of Japan. They annually dispatch companies to the west coast from the gaming, tech, and life science industry. JETRO has an amazing incubator for foreign businesses. Any foreign business who wishes to do business in Japan, JETRO has a one-stop shop where business can lease space in an office which houses a representative from every branch of government in order to expedite the formation of their business. Special thanks to all of the support from the delegates who traveled to Japan to strengthen San Diego’s connections to Tokyo and Japan – SeaWorld, Qualcomm, San Diego Tourism Authority, San Diego County Regional Airport Authority, Port of San Diego, County Supervisor Ron Roberts, and UC San Diego. We look forward to hosting more missions to the Land of the Rising Sun. Lastly, what would a trade mission to Japan be without a trip to a ballgame? Breweries and biotech companies abound. Strong public/private collaboration. A modernized downtown. A breathtaking waterfront. Until I came back from Yokohoma, Japan last week, I thought San Diego was the only place where this existed. I was representing EDC as part of the World Trade Center San Diego’s trade mission to Japan, along with BIOCOM and San Diego Regional Airport Authority, to learn about further strengthening ties between the two regions. Last week, I boarded a plane at Lindbergh Field. Nearly 12 hours later, on one of the most immaculate airplanes I have ever seen, I stepped foot in Narita Airport in Tokyo thanks to Japan Airlines' direct service. A few days and a bus ride later I found myself on the way to Yokohoma, Japan – San Diego’s sister city. From an economic standpoint, it’s an optimal time to launch flight service between San Diego and Japan. Much like the U.S., Japan is climbing out of recession. As such, they’ve adopted liberal spending policies – known as Abe-nomics –to spur investment and growth, so there is a strong potential for increased foreign direct investment . While in Yokohoma, Japanese business leaders exhibited their strong interest in partnering with San Diego companies. We were met with a delegation of 40 business leaders who had ties to San Diego or were interested in creating them. The strong link between Yokohama and San Diego was very apparent- I even met the sole distributor of Stone Beer in Japan! Traveling to Japan also helped me put things in perspective back home. It’s amazing how two distinct countries could have so much in common, yet also have the opportunity to learn so much from one another. The infrastructure in Japan is outstanding. You can move from one place to another with absolute ease. This is something we’re working on in San Diego, but admittedly, we’re just not there yet. On the other hand, while touring a biotech company, I had the opportunity to chat with one employee who had previously spent time at the Salk Institute. He noted that although he prefers Japan on a personal level, he misses the creative freedom of working in the U.S. If he discovered something while in his lab at Salk, he had the freedom to explore that opportunity, in the hopes that it would lead to further research. Although it varies from company to company, he echoed that Japan has more of a regimented work environment. Although each city has excelled in similar industries, we have a lot of lessons to learn from each other. After all, isn’t that what siblings are for? To learn more about San Diego’s most recent business delegation to Japan, you can read Joe Panetta’s guest column in the U-T.